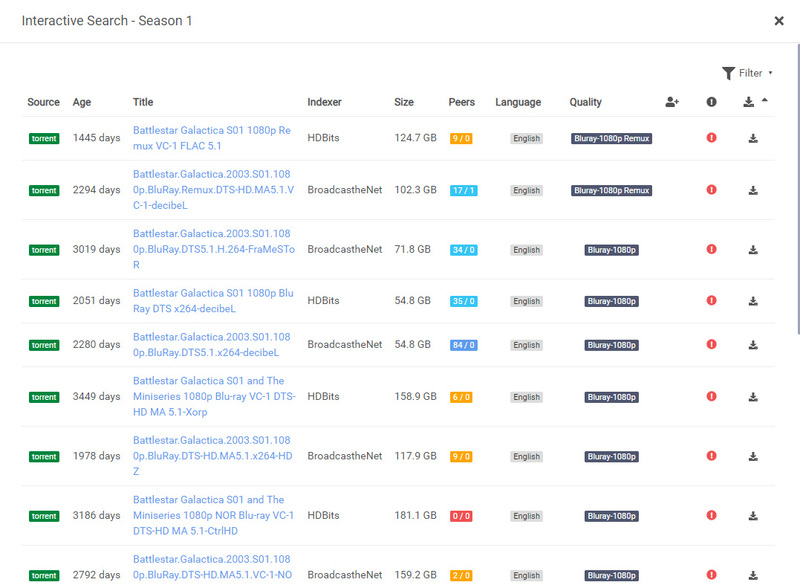 I only recently found out that full season searching for HDBits is implemented in Sonarr 3 (beta), a feature I've been waiting for for a long time. I installed it and was delighted to see it works but on the downside, it seems 360 doesn't take this into account. When I had Sonarr 2.x on the backend, a manual search for an episode or whole series would always bring back full seasons results from BTN but not HDBits. With Sonarr 3.x running, 360 returns no full season results at all any more. Is it much work to hook this up? Not sure I understand the issue. A manual search in nzb360 just receives whatever Sonarr sends back. If it's showing different results than the Sonarr front end, that is odd, and may be indicative of a new API. API changes are likely I would think. The behaviour is indeed different in nzb360 compared to the Sonarr web interface. The native web front end returns individual episodes and full season packs from BTN and HDB, nzb360 only comes back with individual episodes, which in BTN's case means no results at all a lot of the time as they delete individual episodes once a season pack is up.